Everyone is probably very familiar with the Favorites menu, and knows that you can add any menu item that you like there with just a click of the mouse. Did you know that you can also add groups of menu items as well, that copies all of the structure from the area page menu group over to your favorites as well. 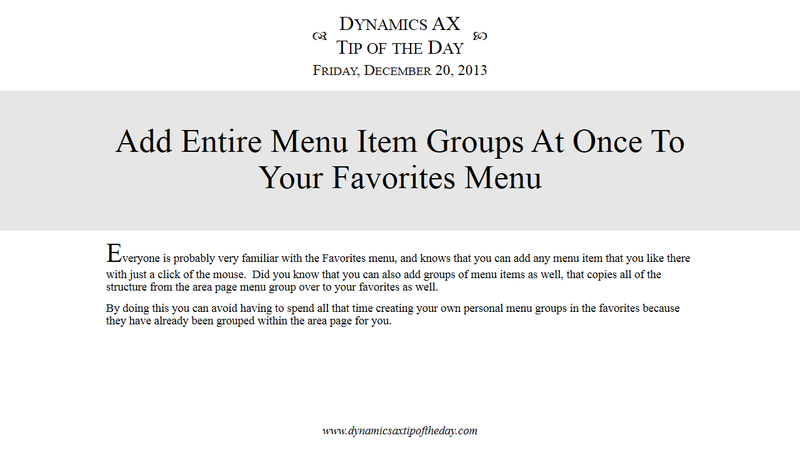 By doing this you can avoid having to spend all that time creating your own personal menu groups in the favorites because they have already been grouped within the area page for you. There are no silver bullets when it comes to solving cases like customer complaints, but everyone usually has a library of common solutions that have worked in the past that they rely on as the first line of defense. 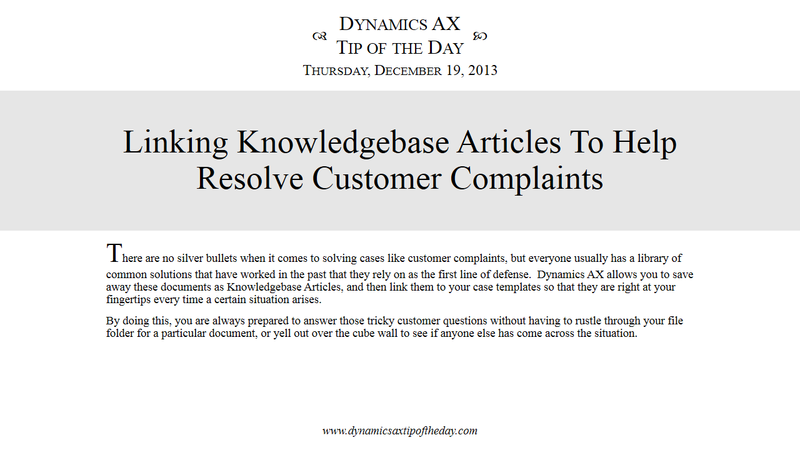 Dynamics AX allows you to save away these documents as Knowledgebase Articles, and then link them to your case templates so that they are right at your fingertips every time a certain situation arises. By doing this, you are always prepared to answer those tricky customer questions without having to rustle through your file folder for a particular document, or yell out over the cube wall to see if anyone else has come across the situation. If you have ever had a situation where another user has perfected the exact screen layout, and you want to use that same layout yourself, but don’t have the time to personalize the forms, then don’t worry. 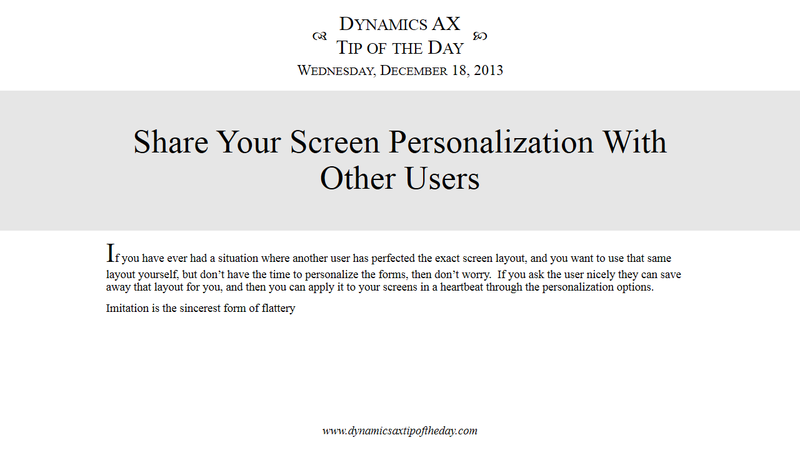 If you ask the user nicely they can save away that layout for you, and then you can apply it to your screens in a heartbeat through the personalization options. You might have already noticed the summary fields that show up in the tab bar whenever you open up forms. These allow you to see the values of some of the fields in the group, even when the tab has been collapsed, which reduces the number of clicks that you have to use to find the key information that you are looking for, and also means that you can collapse a lot of the tabs down so that your are not scrolling through multiple pages of information. You are not limited through to the summary fields that are enabled by default though, you can add almost ay field that you like to the summary tab line just with a couple of clicks. This allows you to see at a glance all of the information that is important to you. 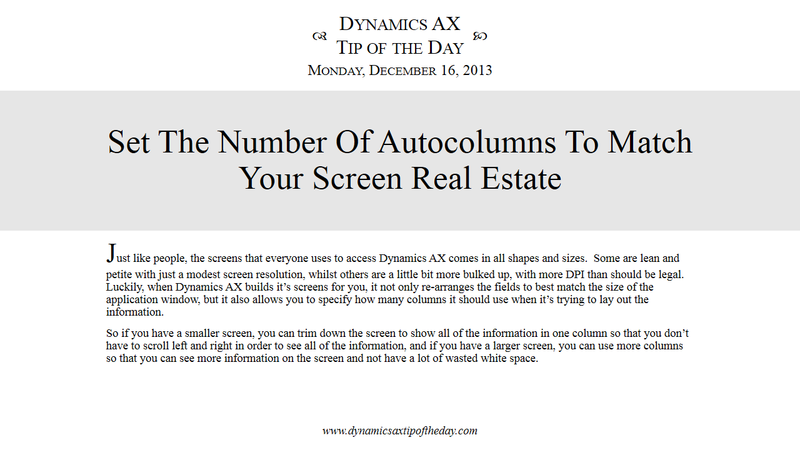 Just like people, the screens that everyone uses to access Dynamics AX comes in all shapes and sizes. Some are lean and petite with just a modest screen resolution, whilst others are a little bit more bulked up, with more DPI than should be legal. 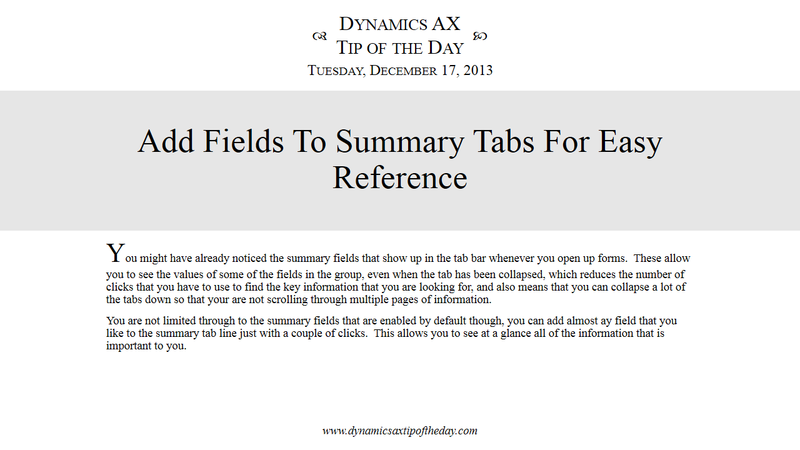 Luckily, when Dynamics AX builds it’s screens for you, it not only re-arranges the fields to best match the size of the application window, but it also allows you to specify how many columns it should use when it’s trying to lay out the information. So if you have a smaller screen, you can trim down the screen to show all of the information in one column so that you don’t have to scroll left and right in order to see all of the information, and if you have a larger screen, you can use more columns so that you can see more information on the screen and not have a lot of wasted white space. 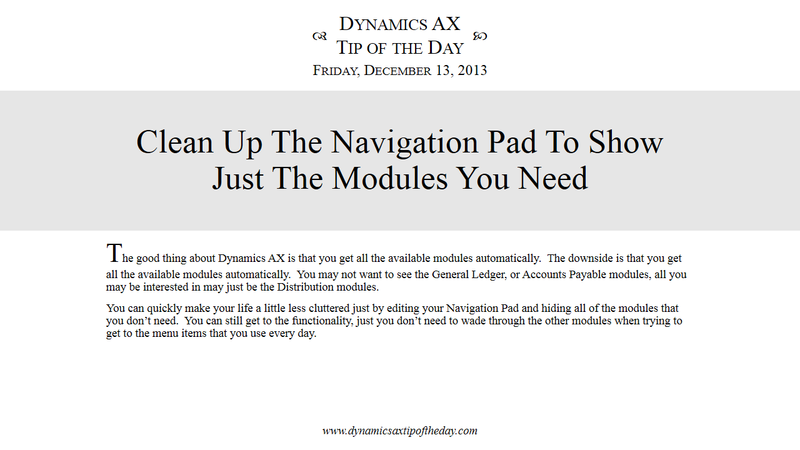 The Role Centers are web pages that you can run independently of the client, and are designed to give you a lightweight way to access most of the functions within Dynamics AX. Since they are just web pages then they can also be embedded in other applications that you may use all of the time, like Outlook, to give you another way to view the status of the organization. 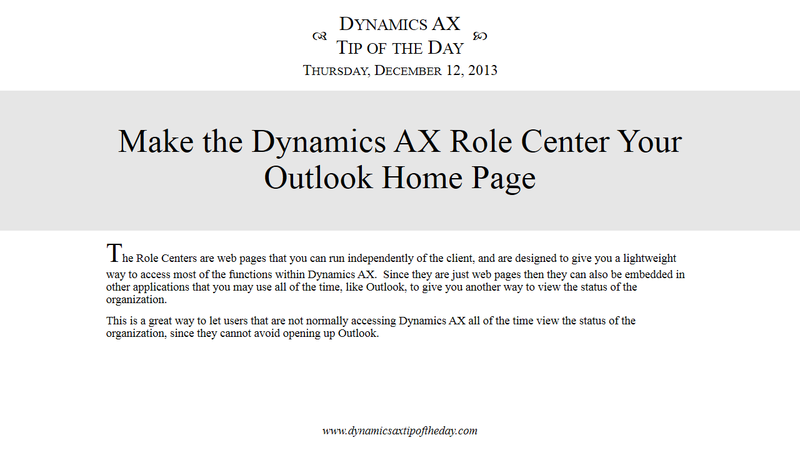 This is a great way to let users that are not normally accessing Dynamics AX all of the time view the status of the organization, since they cannot avoid opening up Outlook.